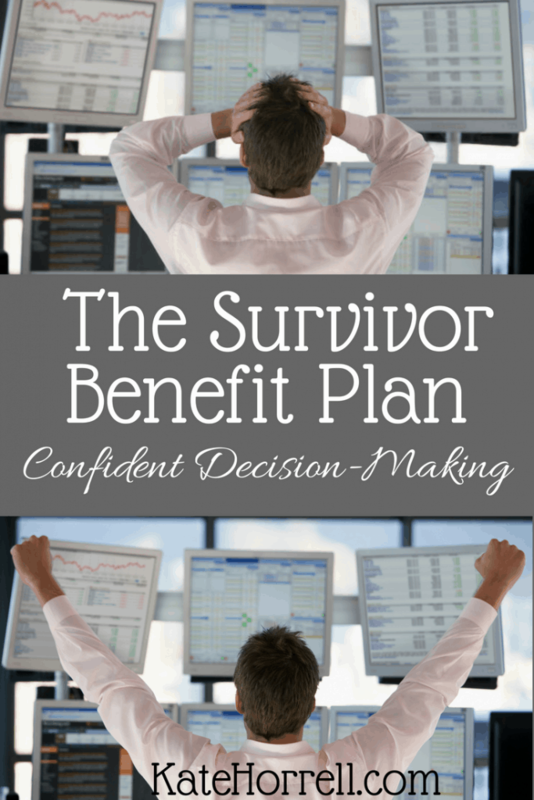 The Survivor Benefit Plan is a very important topic in financial planning for the retired military family, and it’s awfully complicated. There is no single right answer, and even the exact same situation can be viewed from multiple perspectives. While this seems like a question that can be answered simply by math, there is also a strong emotional element. This post wasn’t technically “from the mailbag,” but rather a comment left on a previous post. I am retiring Navy commander after 31 years of service. SBP will cost me (at least) $585 (6.5% of $9K). Accordingly, I am strongly considering a $1M term policy, primarily to handle the mortgage if/when I pass before it’s paid off. We have approximately $500K in equity (in the house, which we plan to sell in 6 years) and approximately $250K in savings and education accounts. With my retired salary (and a follow-on job for a consultant), I think the Term Life plan is a tad bit better. There are a lot of different issues here. I’m not even sure I’ve addressed them all in my response, but I didn’t want poor JC to continue waiting for the long blog post that may never get finished, especially if he needs to make this decision ASAP. The value in SBP is the inflation adjusted, lifetime guaranteed income. If your financial need is to pay off a house, SBP is not the right product to fulfill that need. Term insurance is an excellent product for that purpose. I do wonder about the amount you’ve chosen. You’ve stated that the purpose of the term life policy would be to pay off your mortgage, and that you already have $500,000 in equity in your house. Unless you have a $1.5M house, why would you require a $1M term life policy to pay it off? The next question is, what in your plan provides for income for your survivors? How many children do you have, and how old are they? Do any of them have special needs? Does your spouse work, and has she or he managed to put together a career that could support your family without your income? If not, what other sources of income do you see for them? If you are looking at term life insurance as a source of income for survivors, be sure that your family understands what they would need to do to make that lump sum of money grow enough to beat inflation and last for their lifetime(s.) A simple (but rough) rule of thumb is the 4% rule, which states that you should be reasonably able to withdraw 4% of your principle each year and the growth will ensure that you will never run out of principle. Using that rule, if your heirs invested the full $1M, they would probably be able to take $40,000 in income each year and would probably not run out of money. However, there are several flaws in the 4% rule, and many people think that 4% is too high for many scenarios. In that case, perhaps 3% would be appropriate, giving your survivors $30,000 of income each year from that life insurance policy. Obviously, if your survivors take a chunk to pay off the mortgage, the resulting income would be proportionately smaller. I did see that you anticipate a second career after the military. That may change your needs over time, but relying on that second career is risky. Any discussion of SBP or insurance should be thinking strongly about the worst-case scenario, and this worst-case scenario can’t assume that you’ll have a long and successful second career. I am also confused about your retirement pay and subsequent SBP premium calculations. I calculate that an O-5 retiring at 31 years of service will receive approximately $5574 in retirement pay if retiring under the High 3 system. 6.5% of that amount is just over $362 per month, and SBP would provide an inflation-adjusted benefit of $3,066 per month. Also keep in mind that life insurance vs. SBP is not an either-or question, nor is it an all-or-nothing question. Many people find that a combination of term insurance and SBP fulfill their needs better, and you don’t have to opt to cover the full amount of your military retirement pay. Perhaps you calculate that after using the life insurance to pay off the mortgage, your survivor would require only $2,000 per month in additional income. You could elect to cover 2/3 of your retirement pay, pay a corresponding premium, and provide corresponding benefits. Me, I wouldn’t sleep well at night with a lump sum of money and the responsibility to make it last and to ensure that its value isn’t eroded by inflation. But that’s just me. What does your spouse think about all this? After leaving the comment, but while writing this post, I thought of a couple of additional factors. First, it is always imperative that you don’t make any decisions to decline SBP until you have actually secured a life insurance policy. Sometimes, getting approved for life insurance is harder than you expect, and it would be awful to pass up SBP and then find you are uninsurable, or that insurance is going to cost a lot more than you budgeted. Second, I strongly suggest that anyone making this decision get some third-party help to evaluate the choices, and that help not be someone who can sell you a life insurance policy. My first recommendation would be to take the Survivor Benefit Plan class offered by your installation’s family readiness center. Then, I’d suggest sitting down individually with the Personal Financial Specialist at the same family readiness center. After that, a fee-only financial planner who does not sell life insurance. What other factors have you considered when making the decision how to fund your survivors’ needs? Retiring Military: Should You Choose SBP?